Fry jacks are a staple in Belizean cuisine: delicious golden and crumbly fried dough. They are very similar to the New Orleans beignet, fried bread, and to Latin American sopapillas (alternately spelled sopaipilla), which are made with flour tortillas, and often topped with cinnamon, honey and whipped cream. Sometimes the fry jack is called the beignet without the powdered sugar, since they are typically topped with either honey or jam, or served as a breakfast food with savory accompaniments like beans, bacon and eggs. Basic fry jacks are made from simple recipes that combine shortening, flour, water, salt and baking powder. The dough is then quickly fried in hot oil, which causes the dough to rise slightly, and produces a crunchy, crispy, golden brown rectangle or triangle. 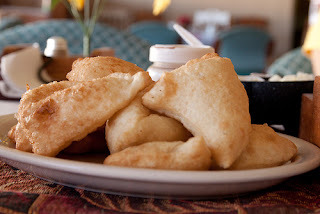 When sopapillas are made, tortillas may be sliced, or they may be fried whole, with the tortilla becoming puffy and crispy as it cooks in the hot oil. Add sifted flour, baking powder and salt together. Fold in the shortening. Add the water gradually until the dough is the right consistency (not sticky but soft) Knead dough and separate into pieces and shape into balls. Roll the balls flat and fry until golden brown. Serve with savoury dishes or with golden syrup.